I get a lot of email asking questions. Most of the time I can provide an answer. Some of the same questions get asked many times, so I put together a FAQ page to answer the most commonly asked questions. Q. Are you selling any extra parts from the '39? A. I am not selling any parts at this time. Q. 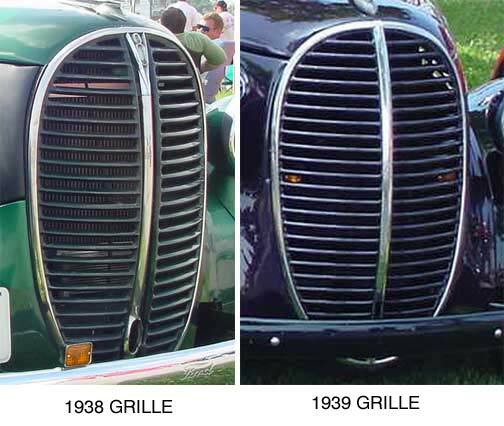 What is the difference between the 1938 grille and the 1939 grille? A. The 1938 and 1938 grilles are different, but are interchangeable. They have the same part number (91C-8203), and the same grille was used on the 1/2 ton pickup as well as the big 1 ton and 1-1/2 ton trucks. The 1938 grille has a three piece center with curved trim and a V-8 at the top. The 1939 grille has a one piece center with flat trim and no V-8 on the top. The trim ring around the outside is the same for both years. Q. What other sheet metal interchanges between the half ton pickup and the "big trucks"? A. The grille, hood, hood sides, and cab are interchangeable. However, the half ton pickup has the gas tank behind the rear axle while the big trucks have the gas tank under the front seat with the filler neck behind the passenger side door. The lower grille panels, fenders, running boards, bumpers, and bumper brackets are different. Q. Where can I find the missing trim for my grille? Q. Where can I find an NOS grille? Q. Where can I find a perfect grille? Q. Where can I find any grille? (1) Truck/hot rod/antique car/antique truck shows and swaps. I sometimes see grilles for sale at these shows. (2) ebay - they come up for auction on a regular basis, but they can get very pricey. (3) Check out the ads in Hemmings Motor News. They sometimes have grilles for sale. (4) You might try contacting some of the big Arizona junkyards that advertise in the parts section of Hemmings Motor News. (5) NOS/used parts dealers. Most of these advertise in Hemmings Motor News. Grilles seem to pop up for sale regularly. The outside trim can be found for sale sometimes. The center trim seems to be very scarce snd is rarely for sale. Q. Where do I find the serial number on my truck? A. The number is stamped in two places: (1) on the top of the left frame rail in front of the cab near the steering box and (2) on the top of the clutch housing. The numbers will match if everything is original. If they do not match, it probably means that the original engine was replaced. Q. How much is my 19 (fill in the year) truck worth? A. I don't know. There is no set "book value" for old trucks. There are price guides, but they are meaningless because there are way too many variables that they cannot consider. I would love to buy some trucks for the prices they list! An old truck is worth what you can sell it for or what you are willing to pay for it. Price also depends on condition (rust or lack of, dents, completeness, originality). Is it complete, painted, and ready to drive away? Does it need bodywork and paint? Is it missing a lot of parts? Is the truck in original condition or modified? What is the quality of the modifications and body work? Does it have a good title? Places to check for rust are front and rear bottom corners of cab, door bottoms, rear of cab, running boards beneath the cab overhang, and bottom of the grille. Also check the frame for rust, especially the passenger side where the cross member joins the frame rail (where the spare tire was mounted). A truck with little or no rust and few dents is worth more because less hours of body work is needed, and (voice of experience speaking) bodywork chews up a lot of time if its done right. How complete is the truck? Some parts you can't buy as reproduction, like the hood, grill, grill trim, and all of the front end sheet metal except the fenders. These have to be found used somewhere. The inside door covers usually tend to be missing too. These are really hard to find. What will it cost to replace missing parts? Most trucks I looked at around here had no bed. A new reproduction bed costs about $3,000. A missing tailgate will run $250-300 to replace. Bumpers are $200 each. It adds up quickly. Part of what determines the price is geography. A truck is worth more in the rust belt here in Pennsylvania where they are scarce than in Midwest where they are more plentiful. Q. Are you selling any parts from the '39? Q. My 1939 truck is bigger than a half ton pickup. What is it? A. Your truck is considered a 1 ton truck. The "Express Pickup" was a new model for Ford for 1938. It was part of their new "One Tonner" line. It sold new for $730. The pickup box was larger (96 L X 54 W X 22.2 D) than that of the half ton models (77.7 L X 46 W X 20.2 D). It also has a beefier chassis and a larger radiator than the half ton. The Express Pickup is certainly rarer than the half ton models. Unfortunately, parts unique to the Express Pickup are very hard to find. [Actual email] Felicitaciones, excelente la informaci�n... Durante mucho tiempo he buscado informaci�n para restaurar mi camioneta Ford 1938 y es ahora cuando verdaderamente la encuentro.La unica limitante es el idioma debido a que mi ingles no es completo. Me gustaria tener contacto contigo para intercambiar informaci�n.